National Novel Writing Month – Should I do it and how should I tackle it? Writing 50,000 words in just 29 days. Sounds near enough impossible right? Yet still, year after year, writers from all around the world pledge to complete this mammoth task during the month of November. So, should you do it? Well that all depends on whether or not you fancy a challenge, need a kick up the backside to get going on your first draft or just want to take part in a recognised and enjoyable competition with a great sense of community. In other words, why not! Have I ever done it, and will I be doing it this year? I have yet to participate in NaNoWriMo, and sadly don’t have time this year (due to a planned holiday, my birthday, several other creative projects and working full-time). It is something that I am very keen to do at some point in the next few years though! I’m very much a ‘sit-down-and-bash-out-5000-words-in-one-go’ kind of writer, so it’s definitely a challenge that appeals to me. I would no doubt end up with 50,000 words of rubbish, but it’s better than not having the words in the first place – at least then you can mould them into something that vaguely resembles a coherent story! If I was going to take part, what would I do? 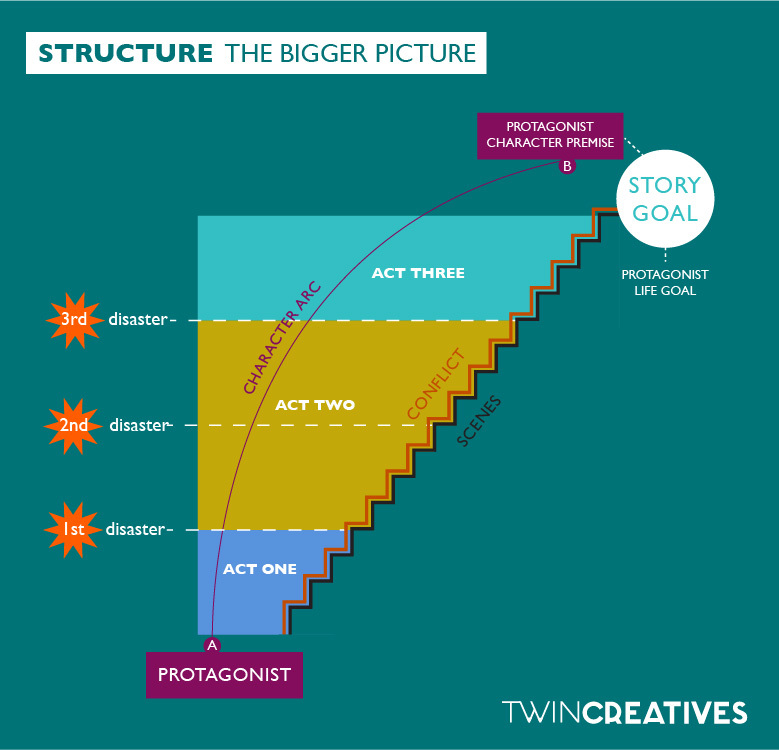 Tip – If you’re new to writing, I would swot up on story structure a little bit beforehand. Understanding the basic elements of a good story will help you in the long run. I found this website (http://www.how-to-write-a-book-now.com) extremely helpful when I was just starting out. You might also want to check out Becca’s article here or google ‘the structure of a novel’, or similar. I would begin the month with a creative brainstorm. Coming up with ideas for your novel will get you fired up and excited to start. Perhaps spend a day or so just people watching, maybe go for a walk and record overheard conversations. Make notes of interesting looking people and places; these notes could inspire characters, setting and scene ideas. Read newspapers, listen to music and read other books. You get the drift. I find when I stress out about coming up with ideas, I struggle to find them. By approaching the inspiration process in a more relaxed and creative way, you should find that ideas come to you more easily. Go on Pinterest/ Instagram/ Google and search for writing prompts. Visit our inspiration board (which we intend to add to in due course). Adopt-a-plot: most years, you can find an adopt-a-plot forum on the NaNo website. Here, people comment story ideas which they like but don’t want to write. You can adopt these ideas, or use them to inspire your own. There are also some writing prompt apps which might help – I personally didn’t find them that useful but it’s definitely worth a try! I’m an outliner. I can’t imagine sitting down to write a novel without having an idea of where I’m headed. But that’s just me – plenty of people write without thought or pre-planning, and just let their ideas take hold (which a lot of people do during NaNoWriMo). If, like me, you don’t want to just ‘wing it’, you can spend a day or two outlining your novel. As you will be writing fast, it will help to know the basic plot milestones, points of conflict and character development that will arise during your novel. You can read how I outline here. Having spent 2–3 days planning, I would then just get on with it and write (no surprises there…). Even if what you’re writing is awful, try not to edit it – at the end of the day, you are writing a first draft, and, as we all know, first drafts are generally really, really bad. You can read the top 30 funniest comments on my first draft here. If you’re worried about getting the details of your story correct first time (IE it’s set in a certain city) then you can spend a day or so researching. Bear in mind though, this will take time out of your writing time. It might just be best to ‘block’ out these details, and expand on them at the end of the month. If you have time, it would be good to set a minimum word count for each day. 30 days – 3 days planning = 27 days. 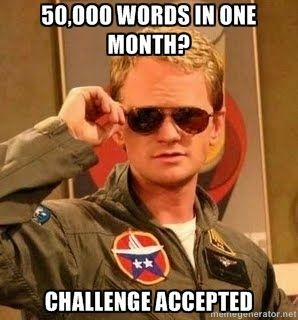 50,000 words / 27 days = roughly 1800 words a day. If you stick to this, you should have no problem hitting your word count. I like to write in big blocks, and could easily rack up 4000 words a day, so 2000 ish should be doable. If you like to write in short stints, you could instead write 600 words, 3 times a day (as an example). Do whatever works for you. Just remember, if you skive off one day, you will have to make up the words another day. I try to do this (and fail most of the time). If, like me, you end up skipping lots of days (life happens ey) you will end up adding more words a day than is possible to write. Long story short, don’t skip days, as it will end up biting you in the bum! If you are struggling to find motivation to hit your word count, give this article a read. Just don’t spend too long procrastinating and willing motivation – sometimes, the best thing to do is too just force yourself to sit down and write! Also, try to remember, you are doing this for fun. The more you enjoy the writing process, the less of a chore it will be, and the more likely you are to hit your word-count. 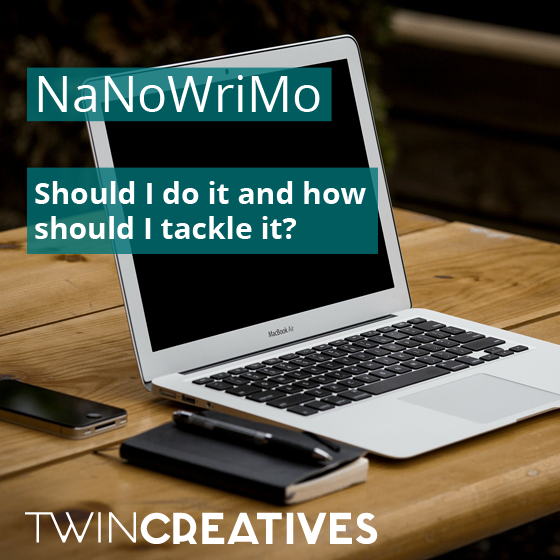 Has anyone got any experience of NaNoWriMo? Would you do it? And how would you approach it? Comment below! This will be my 8 year doing NaNo – and it’ll be my 8th year winning too! Though this is the first year where I will be doing some planning before hand! I’ve never planned or outlined a novel before so we’ll see how this goes! I (Heather) participated in (and won) Campnano during July and although it was tough, I achieved so much and finished a draft that’s been kicking around for months! I think every writer should try it at least once.